This section of the website provides an insight into archaeological artefacts from Exmoor. 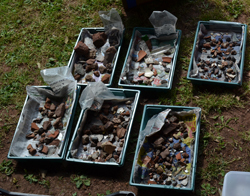 This may include items recovered from excavation, chance finds from the ground's surface or within private collections. Many of these objects can be seen in local museum collections. Archaeological finds are important because they can help to tell us how a site was being used and what date it is. Objects are particularly useful when they are found and recorded in their stratigraphic context (or original position in the ground, where they were originally placed, discarded or lost) because this gives us information about that context. If an object is unstratified (for instance, it has been ploughed up in a field during normal farming practices), the find can still help to show where a site may exist below the soil if the position it was found in is known. If you happen to notice something which you think might be ‘archaeological’ in your garden don’t discard it! An archaeological object could be pottery, metal, flint, stone or any other material. Collecting this material is a very helpful way of understanding the area where you live and how it has changed over time. ONLY collect material that you have found on the surface, or during the course of other activities – do not dig up an area just to look for archaeological material! Also, you must not collect material from other areas without the permission of the landowner, or from a site designated as a Scheduled Monument (see the National Heritage List for England for more details). If you have a find and are not sure what it is, keep it and treat it as an archaeological find. If the object is pottery and not too fragile it can be washed using water only. Do not wash metal or use any cleaning products. Let the object dry fully and naturally, away from direct heat or sunshine. Put the object in a strong plastic bag, labelled on the outside and with a label inside saying where you found it (including address), the date you found it and your name and contact details. Your local Portable Antiquities Scheme officer can tell you what you have found and record it on a database; please see the Portable Antiquities Scheme website for further details. Below you will find a list of finds organised by their date.